Nikki Darling-Kuria has more than 14 years of experience in early care and education. A family child care professional and adjunct college professor, she also develops curriculum for early care and education programs and has written numerous articles for early childhood education publications. Nikki holds a master's degree in human development and a bachelor's degree in early childhood education. Give children stronger, more meaningful learning experiences with eighty brain-based activities that engage both hemispheres of the brain. Each activity promotes learning in the areas of language, mathematics, science, art, music, and the environment and encourages physical, social, and emotional development. Included are materials lists, extension activities, variations for multi-sensory exploration, components for diversity, and an explanation of the brain connections being made. 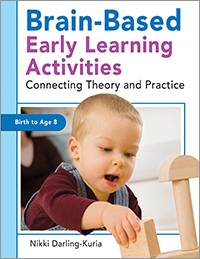 Brain-Based Early Learning Activities also provides a comprehensive overview of early brain development and key components necessary to create a brain-based early learning environment. Softbound, 264 pgs.